Norman Hepple was born in 1908 and lived and worked in London. He was the son of Robert Hepple the painter and nephew of Wilson Hepple the Northumberland animal painter. The Hepple family came from the village of Hepple in Northumberland. Educated at Colfe's Grammer School Blackheath, he went on to study at Goldsmiths College School of Art and from there to the Royal Academy Schools to study under Sir Walter Russell. In 1948 he was elected member of the Royal Society of Portrait Painters and was President from 1979 to 1983. In 1954 he became an Associate of the Royal Academy. 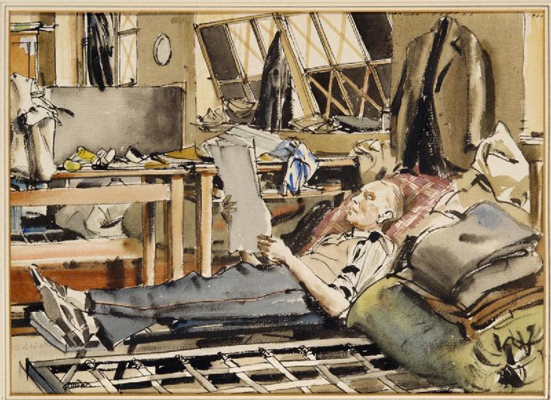 During the World War II Hepple joined the London Fire Service and became an Official War Artist to the National Fire Service. His war paintings are exhibited in the Imperial War Museum. 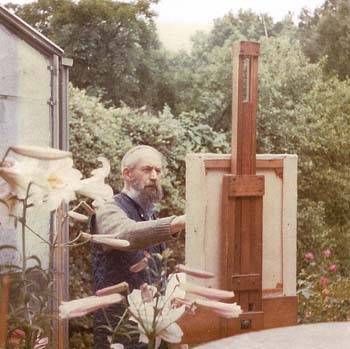 Norman Hepple painting at his home. By permission of Hepple estate. 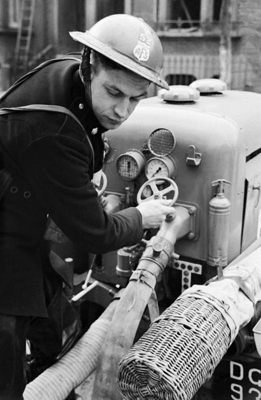 Auxiliary Fireman Norman Hepple switches on the water to the hose from a trailer pump, somewhere in London in 1940. Hepple painted many portraits of the Royal Family including H.M. The Queen, The Queen Mother, Prince Philip, Prince Charles, Princess Alice, and Princess Alexandra; the Dukes of Westminster, Portland, Rutland, and Roxburghe. 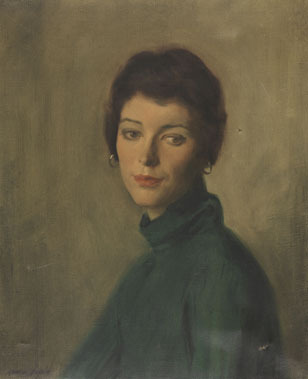 Aero girl portrait by Hepple now lost, circa 1950. By permission of Hepple estate. 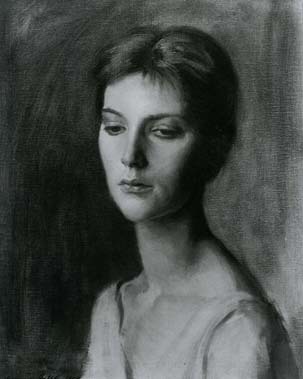 Mary by Hepple c.1950. Oil on canvas. 24 x 20inches. R/Aerogirls. Borthwick Institute for Archives. By permission of Nestl&eacute; UK and Ireland. Norman Hepple painted multiple Aero Girls commissions for J. Walter Thompson (JWT). Two of his original portraits, labelled by the advertisers as Mary and Yvonne are held in the Rowntree & Co. Ltd archive within the Borthwick Institute for Archives. The paintings are sombre in tone and depict a more mature woman than many of the other Aero portraits. 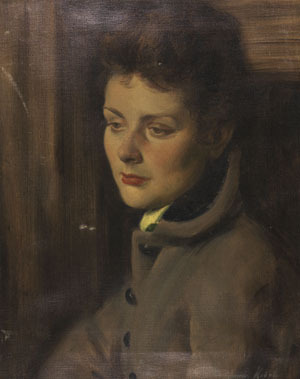 Norman Hepple painted his sitters at the Rossetti Studios in Chelsea, where he lived following the end of the war. His studio was purpose-built and north-east facing. As a living space however it contained little more than a gas stove. Hepple frequented the Chelsea Arts Club for breakfast and dinner, where he probably first met his friend and fellow Aero artist Anthony Devas. Devas later moved into the Rossetti Studios on 72 Flood Street. Several Aero Girl models who sat for Hepple had visited the Rossetti Studios looking for work. His models were paid half a crown per hour. Another sitter whom he painted for Rowntree was discovered whilst the artist was strolling with his wife in Kensington Gardens. Hepple saw the woman and exclaimed to his wife, "she's interestingly different", just what the advertisers JWT were looking for. Other Aero models were friends of Hepple. All of Hepple's subjects were aware that their portraits were destined to advertise Aero chocolate. BBC/Public Catalogue Foundation. Norman Hepple. Retrieved 2 March 2014. John Ward (15 January 1994). Obituary: Norman Hepple. Retrieved 2 March 2014.